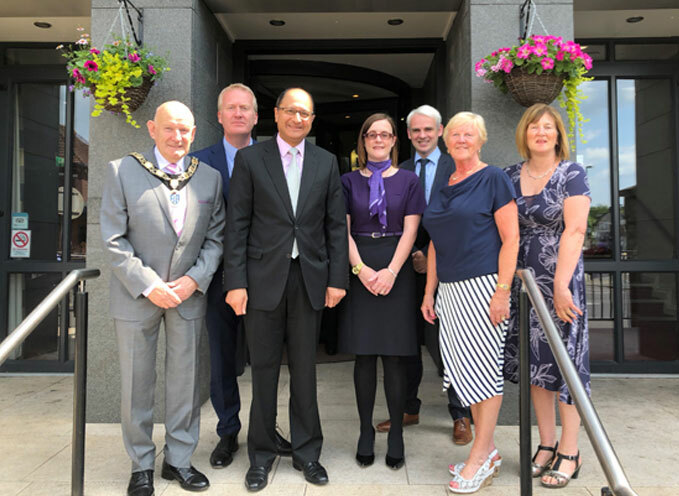 On Thursday 7th June the President of the Ballymena Chamber of Commerce and Industry, Robin Cherry MBE, hosted a lunch for Shailesh Vara, Under Secretary of State for Northern Ireland. Robin was accompanied by members of the Chamber Management Committee who saw this as an ideal opportunity to discuss the future of business in Ballymena with a senior Government official. During the lunch the Chamber representatives discussed a range of issues which related to businesses both in the town centre and in the general Ballymena area. Issues addressed included the need for inward investment, tourism, airport taxes, the hospitality sector and the need to improve skills and offer worthwhile apprenticeships to young people. The Management Committee stressed that Ballymena occupied a unique position and that as well as being a major retail sector it had a first class industrial and manufacturing base with a large number of skilled workers and innovative entrepreneurs. The Minister was very receptive to the arguments put forward and agreed to take these issues back to discuss with his colleagues. The Chamber of Commerce see opportunities such as this as key to ensure Ballymena receives support where necessary from both local and central government. Chamber President Robin Cherry said ‘Ballymena has progressive and forward thinking retail and industrial sectors and we must ensure every effort is made to sustain and grow the economy in the local area.’ The President reminded Minister Vara of the importance of food security and the fact that the Agricultural Sector is the biggest employer in the area. He also said that the Chamber of Commerce will be hosting events and lobbying both local and central government throughout the coming months in order that our businesses are given every opportunity to thrive in today’s competitive market.